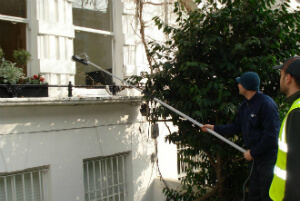 Office & Home Window Cleaners Rush Green RM7 | Quality Property Care Ltd.
Quality Property Care Ltd. delivers domestic windows cleaning and commercial windows cleaning to all businesses and residents in Rush Green RM7 and the region. The window cleaning is done by very well trained, vetted and experienced windows cleaners, who use the telescopic water fed poles to first wash off and if necessary scrub off the dirt, and then to rinse anything off. If the frames and sills are from PVC, they can be cleaned too. The purified water contains no residue or minerals, so it is left to dry the natural way and leaves no stains or streaks. Plus, it helps protect the windows from dust buildup for longer. No ladders are used and no manual scrubbing, so there is no peeking inside your office or hom by the cleaners. The products and services delivered by Quality Property Care Ltd. are licensed and approved by a number of institutions and agencies, and are highly recommended both as a commercial window cleaning service and a domestic windows cleaning service. 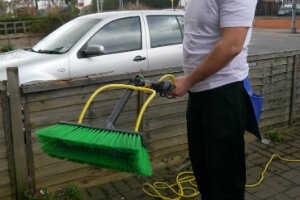 The windows on all kind of commercial properties and domestic properties can be cleaned, as long as they are reachable. For higher floors the company will provide a well-equipped and skilled rope access window cleaning staff.You can get sticker removal in addition. The only demand for the windows cleaning with the help of the water fed pole, is that there is an available parking area for the company’s van at a range of less than 30 meters from the windows. The purpose is that the tank with purified water is in the van, and it is where the water is pumped out of. So whether you are in dire need of the professional commercial windows cleaning service or the home windows cleaning service provided by Quality Property Care Ltd., all you have to do is book the service or services you need, and you will ensure that the light shines brighter in your home or office again. Feel free to reserve our budget friendly and eco-friendly window cleaning support right now! We are available on 020 3746 4287! Get a cost-free estimate now or use the direct online booking form for direct booking!